Spanish Present Tense Verbs BIG Bundle: 20 Worksheets at 50% off! 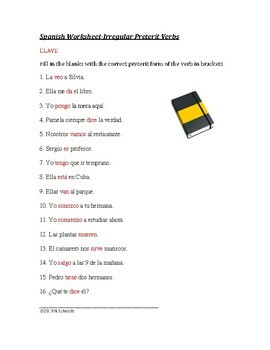 This worksheet features 16 fill in the blank exercises in the present tense. ALL the verbs are irregular in some way: first-person irregular (conozco), stem-change (mueren/sirve) or totally irregular (es/tiene).